This week we look at cruise selling practices on each side of the Atlantic and how they differ, examining the spread of attempts to stop cross-border sales by cruise lines and differing approaches to commission on each side of the Atlantic. Last Tuesday, meanwhile, the whole of P&O Cruises’ UK-based fleet of seven ships called in the port of Southampton. Inspected by Princess Anne, all seven sailed out again in single file with some 15,000 passengers on board. P&O Cruises Australia and DP World in Dubai, now owners of P&O Ferries, are also sharing this 175th Anniversary. And finally comes word, also from Dubai, that the Queen Elizabeth 2 is to be opened in eighteen months as a 300-room luxury hotel at Port Rashid. Cruise selling policies differ on both sides of the Atlantic, the most obvious contrast being that in North America deposits remain fully refundable up to final payment date, while in Europe’s largest cruise market, the UK, one forfeits their deposit if they cancel. But even in Europe practices differ. In Germany, for example, Europe’s second largest cruise market (and soon to be largest), deposits are usually refundable up until just a month before sailing. But in the meantime, a couple of other noteable differences have sprung up in recent times, first on who can buy a cruise where and second on agents remuneration. On the first subject, P&O has long been known for prohibiting cross-border cruise sales. Three decades ago, the author was quoted a fare by P&O Los Angeles on a cruise from Sydney that was 33% higher than the same cruise quoted in Australia. A similar complaint was made to UK cruise magazine “World of Cruising” in more recent times when Swiss clients were told they had to book a Princess cruise through Swiss agent Kuoni at a higher fare than offered in Florida. Through its association with P&O, this restriction has now also spread to Cunard, which no longer allows cross-border bookings and whose Transatlantic sailings can be as much as 25% more expensive in the UK. But even here there is no consistency, as sometimes UK fares for the same sailing are lower than the US fares. Meanwhile, this prohibition has spread beyond P&O. To cite an example, Vacations to Go, a US agent with a UK phone number, states on its web site that “the following cruise lines now prohibit all US travel agencies from selling cruises to citizens of countries other than the US and Canada, unless they have a residence in the US or Canada. More recently, appointed as US agent for P&O Cruises, its site adds for good order that “residents of the UK may not book P&O Cruises through Vacations To Go.” Missing from the list is one line that used to be there, namely Costa. In an age of globalisation this practice of cruise lines prohibiting cross-border sales is in effect a restraint of trade and we wonder how legal it is. Apple once tried something similar with its iTunes pricing within Europe, restricting buyers to making purchases in their own country, and thus forcing some to pay higher prices. In 2004 the UK Office of Fair Trading referred Apple to the European Commission for violation of EU free-trade legislation and in 2007 Apple was threatened with a £330 million fine. In the end Apple had to agree to offering common pricing throughout Europe. In a single market such as Europe customers should be free to purchase goods and services from any member state, but this still appears to be not the case with many cruise lines. On another subject, P&O, Princess and Cunard last year announced that they would cut agents’ commissions in the UK to 5% in an attempt to try to stop them from rebating, a process whereby agents would pass on part of their commission to the client in order to “buy” their business. Meanwhile agents selling the same Princess and Cunard cruises in North America (and elsewhere) are still paid on a scale of 10-15%. One of the reasons P&O, Princess and Cunard UK did this was apparently a fear of being accused of resale price maintenance. This is a practice whereby a manufacturer and its distributors agree on pricing, a practice that is outlawed in the UK. But whether a service is a manufactured good and an agent is a distributor are moot points. Meanwhile, this spring, Fred. Olsen Cruise Lines’ adopted a different approach, which is to offer 10% agency commission and threatening to stop sell agents who rebate from their commission. Those who did not rebate would be rewarded by a 5% bonus at the end of the year. This in effect would punish agents who rebate, as opposed to punishing those who do not rebate by cutting their income, which was the case with P&O, Princess and Cunard UK. The Fred. Olsen approach shows strength and is a refreshing change and it will be interesting to see where this all goes. Clearly at 5%, P&O, Princess and Cunard UK are well below the usual cruise sales norm of 10%. Back in North America, on August 1 Carnival Cruise Lines will further toughen its own anti-rebating stance. From that date, agents may only offer clients non-cash value-add-ons equivalent to a maximum of $25 per person. Non-cash equivalents means bags, hats, beach towels, memory books, sunglasses or Carnival favours delivered on board, and on-board credits will no longer be allowed. Carnival first introduced level pricing in 2003, then an advertised price policy in 2005. Meanwhile, there was a lot of collateral damage among agents who were not rebating. Royal Caribbean has also been tough on North American agents who rebate and at one stage even put a stop-sell on Vancouver-based CruiseShipCenters, now Expedia CruiseShipCenters. But Royal Caribbean and Celebrity Cruises also continue to offer normal commission levels in the UK market, leaving P&O, Princess and Cunard somewhat isolated. Indeed, it was Royal Caribbean Cruises’ ceo Richard Fain that told a London audience in April that the agency distribution system “is not broken” and that Royal Caribbean would take “no precipitate action” on commission levels. How different things are on the two sides of the Atlantic! Two separate companies are celebrating the 175th Anniversary of the founding of the Peninsula & Oriental Steam Navigation Co Ltd, as it was known. Both P&O Cruises and P&O Ferries are celebrating this anniversary, but last week it was the turn of P&O Cruises. On Tuesday, all seven of P&O Cruises’ UK-based ships – Adonia, Arcadia, Aurora, Azura, Oceana, Oriana, and Ventura – were in Southampton together for the first time ever. Princess Anne, in her role as Master of the Corporation of Trinity House, then closed the day by conducting a fleet review from the Trinity House flagship, lighthouse supply tender Patricia, as the seven ships sailed down the Solent from Southampton in a single line. The Royal Navy’s Type 45 destroyer HMS Dragon was also present, with her crew standing in ceremonial uniform as the P&O cruise ships took a half hour to pass. P&O Cruises managing director,Carol Marlow said it was an honour to have Princess Anne attend the official reception on board Oriana. “As one of our esteemed godmothers, Princess Anne’s presence and the congregation of our entire fleet to celebrate 175 years of heritage will go down in British maritime history and provide long lasting memories,” she said. 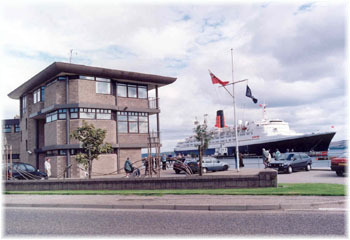 The Princess Royal named named two of P&O’s ships, the Aurora in 2000 and Oceana, ex-Ocean Princess (I) in 2003. Also lending glamour to the event was ballerina Darcey Bussell, godmother to P&O Cruises’ flagship, the Azura. P&O can trace its roots back to 1837, when the original Peninsular Steam Navigation Company was awarded an Admiralty contract to carry mail to the Iberian Peninsula and last Tuesday’s Grand Event capped what will be a year of celebrations to mark 175 years of heritage. Some 15,000 embarking passengers and 6,000 crew were on board as the ships sailed off on seven different itineraries. Down under, P&O Cruises, Australasia’s leading cruise line, also provides year-round sailings on three ships. The Sydney-based Pacific Pearl and Pacific Jewel and Brisbane-based Pacific Dawn are celebrating the line’s 175th Anniversary as well. Ironically, these three ships are still registered in the UK while the UK-based fleet all now fly the Bermudian red ensign. A fourth Australian-based ship, Pacific Sun, was recently sold to Chinese owners. Meanwhile from Dubai, DP World is also celebrating its own 175 years of P&O heritage. As the owners of P&O Ferries and the former P&O Ports, DP World has developed an in-house team of curators dedicated to maintaining and preserving the 25,000 items and archives that make up the P&O Heritage Collection. The DP World P&O heritage site can be found at www.poheritage.com. Most recently, P&O Ferries have invested in two new 49,000-ton ships, Spirit of Britain and Spirit of France, the largest ever built for the Dover-Calais route. P&O Ferries still offer overnight mini-cruises from Hull to Amsterdam, Rotterdam or Bruges and day breaks from Dover to Calais. Meanwhile, good news came from Dubai last week. After five years of lying dormant, the former Cunard liner Queen Elizabeth 2 is not now going to be lengthened and converted with a see-through funnel and lifeboats removed, but will remain much as she is and will be converted to a 300-room hotel at Port Rashid, near where Dubai’s cruse ships call. Talks are now under way with three hotel groups, including Dubai’s Jumeirah chain, to manage the new hotel. Although many will not want me to make the comparison, the ex-Cunarder Queen Mary, which entered service in 1936, now operating as the Queen Mary Hotel in Long Beach, has 314 rooms. So in terms of size the two operations will be similar. Queen Elizabeth 2, on the other hand, was launched by Queen Elizabeth II in 1967 and went into service in 1969. Istithmar, part of Dubai World and owners of the QE2, have announced that the revised hotel plan is to come into operation within 18 months as the centrepiece of an entertainment village that will include a maritime museum. Istithmar bought the ship from Cunard for about $100 million in 2007 and plans to open the ship on the man-made island of Palm Jumeirah were shelved with the recession. The ship is now registered in Port Vila, Vanuatu.